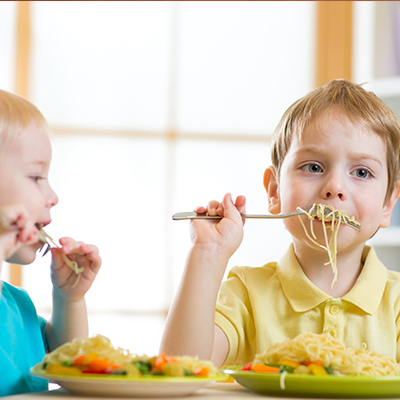 Family-style dining helps children develop poise. Knowing how to act at the table and how to talk without interrupting each other helps a child know how to act in public. It improves motor skills and coordination, especially if you don’t pre-plate a child’s food. It takes considerable coordination to move food from a dish or platter. Likewise, it takes coordination to use all types of serving utensils. Add to that the fact that food comes in many sizes, shapes, and consistencies, and you have a perfect motor-skill exercise. Family-style dining provides chances to show acceptance and kindness. Food can get spilled, drinks can get turned over. Accepting and encouraging your child in spite of a mess does wonders for the child. It helps develop self-confidence and independence. If a child is at the “I can do it myself” stage, you can safely allow the child to serve himself or herself with no lurking dangers. A little mess is something you can easily handle, especially when the benefit is engendering independence. We invite you to learn more about The Academy and how you can become part of our family.